The breed of Ocicat was born from a breeding of an Aby-Siamese hybrid female to a chocolate-point Siamese male. 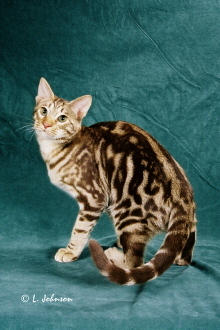 This breeding produced a male kitten with golden spots and an ivory background. With only domestic cat bloodlines, the Ocicat possesses the best of both worlds - a loving, playful, intelligent temperament combined with the athletic, muscular, spotted look of a wild cat. The American Shorthair breed was introduced at a later time to produce the 12 varieties of colors we see today. In May 1987 the Cat Fanciers' Association accepted the Ocicat breed for Championship. Today, the Ocicat has not only found a place in the world of pedigreed cats, but in the hearts and homes of many. Of course, not all Ocicat kittens are destined to be show cats. The show cat is spotted - the Ocicat comes in other patterns including classic tabby, ticked tabby and solid (ghost spotted). And not every kitten has the type needed. These kittens from show cat litters make the best pets, they have the temperament needed to be handled and shown, but aren't quite what is needed in the ideal show cat. 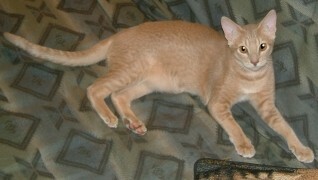 Click for the Ocicat information from the Cat Fancier's Association Web Site or visit the Ocicat Breed Council website.